Lot of guys have been having fun with the airtel 1k for 3gig . 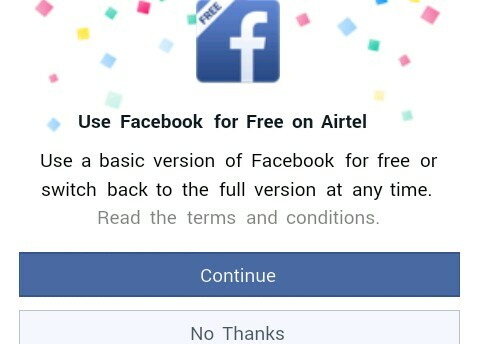 Airtel, the smartphone network has given its subscribers free facebook browsing on their device. So if you are seeing this for the first time, go and grab your Airtel sim now. This is not a cheat of any kind,this is a free promo by Airtel to all its subscribers. This means you don't have to subscribe to their Facebook bundle nor have any data bundle. This facebook airtel free browsing works both on Pc and Mobile devices and is a direct connection that doesn't require any VPN. How can i Start Enjoying free Facebook on my Airtel sim? Open your browser and input http://free.facebook.com in the url address and start accessing your facebook account for free. However the online sad thing is that it doesn't load images and videos. So if you can do without images and video streaming, u are good to go. You can still chat with your friends and make posts. If it doesn't open in one browser on your phone, try another. I got an error message when I used uc mini but works fine on Firefox, chrome and my phones default browser. You can also use www.freebasic.com works better on operamini. Try it and tell us your experience using the comment box.